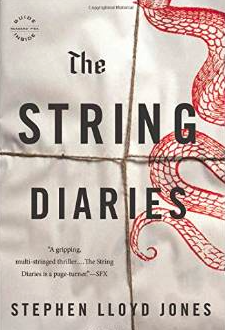 When I read The String Diaries earlier this year, I was simply amazed. I’d expected a thriller. What I didn’t expect was something as exceptionally well-written. Stephen Lloyd Jones, a British marketing executive, has managed to create a tight, sometimes ultra-violent tale crafted with all the emotion and color of a heightened romance. And then I discovered Written in the Blood, the sequel. I started it with a certain apprehension. 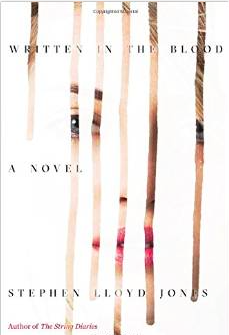 What I didn’t want was a sequel written for the sake of writing a sequel: a retread; a bland reimagining of the first. What I got was none of those things. Far from a drab retread, Written in the Blood is bloody brilliant, a furthering of the original, an enhancement written with the same keen attention to an endless series of gorgeous details. Lloyd Jones loves color and texture and subtlety. He loves tingling the reader’s senses in the most extraordinary way. Blood gives him all the chances to tingle them that Diaries did, except that now he has his heroines are losing even more — which, given the losses in the first book, is saying something. One of them travels far and wide this time, feeding the author’s imagination as much as the reader’s. The two books are complex tales of love, heartbreak, and revenge that traverse generations. There’s a secret society, and more than a little malevolence in some characters’ ability to transform their bodies to look like other people. One of these shape-shifters, Jacab, drives the action as he searches across time and geography for both love and vengeance, and the young woman he’s after, Leah, can almost smell him getting closer and closer. So can we. This elaborate cat and mouse game is wonderfully realized and hits almost every note perfectly and never disappoints. Lloyd Jones leads the reader into his characters’ minds and memories and even their eyes, with descriptions so glorious that they’re sometimes gasp-inducing. With equal exuberance, he paints lovely internal narratives and external worlds, and the story happens where the two intersect.